(Left to right)Dylan Bradford, Sid Shifflet, Gabe Skaggs, Choir Officer Nick Grey (Jr. Rep), Choir Officer Ryan Thompson (Sop. Rep), Shaelee Nichols, Tori Carr, Maddi Gills, Choir Officer Addison Guilliams (President), Choir Officer Ivy Ferguson (Vice Pres. ), Choir Officer Alicia Smith (Treasurer), Mrs. Linda Tieman, and Dr. Vincent Scarpinato. Yesterday Dr. Vincent Scarpinato, on behalf of the SOMC Breast Cancer Compassion Fund, was presented with a check from the Portsmouth West High School Chamber Choir for the amount of $1,309. 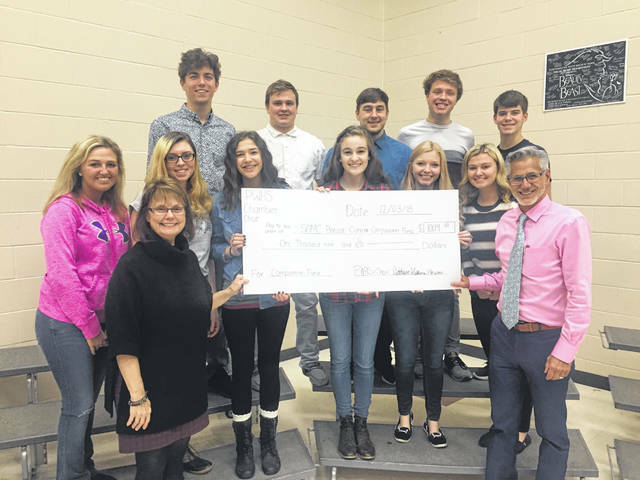 The PWHS Chamber Choir, under the direction of Linda Tieman, have collected funds annually for the compassion fund since 2009, and every four years holds a benefit in its honor. This year members of the PWHS Choir raised money the entire month of October by selling paper chain links for a quarter which you could write the name of someone fighting breast cancer, someone who has fought breast cancer, or your name to show support for the cause. Each year the chain is stretched across the football field during the last home football game of the season, but this year due to the weather, the chain was instead displayed indoors. Additionally, students sold t-shirts and received donations from generous donors to go towards the fund which provides support through many different avenues for those fighting cancer. Tieman says she is continually proud of her students for being thoughtful and hardworking individuals. Dr. Scarpinato stressed his appreciation for the student’s efforts, and stated that acts of kindness like this one from the community make him proud to reside in Scioto County. “The Breast Cancer Compassion Fund was started about eight or nine years ago, and Linda (Tieman) and I have done lots of different benefits over the years, it’s really special when the students decide to do something on their own, and it’s not us asking them. They decide, and it’s very humbling to get a check for $1,300 dollars from the students who sold something for a quarter each. We’re really proud of the kids and I feel honored to live in a place where people come out of the community to give you a check for a great cause,” said Scarpinato. https://www.portsmouth-dailytimes.com/wp-content/uploads/sites/28/2018/12/web1_PWHSChoir_ne201812313355833.jpg(Left to right)Dylan Bradford, Sid Shifflet, Gabe Skaggs, Choir Officer Nick Grey (Jr. Rep), Choir Officer Ryan Thompson (Sop. Rep), Shaelee Nichols, Tori Carr, Maddi Gills, Choir Officer Addison Guilliams (President), Choir Officer Ivy Ferguson (Vice Pres. ), Choir Officer Alicia Smith (Treasurer), Mrs. Linda Tieman, and Dr. Vincent Scarpinato.